118 x 177 mm., 4 ½ x 7 in. Racing is recorded at York from Roman times but was well established at Clifton before moving to its current location on the Knavesmire in 1731. 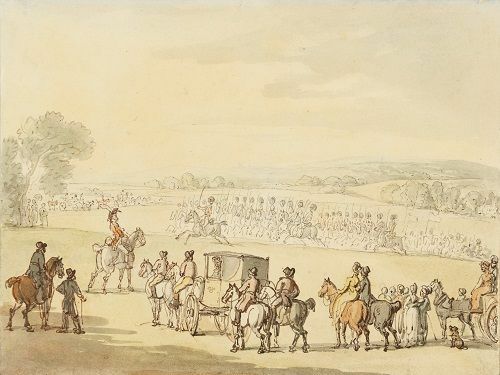 The first Grandstand, as depicted here, was built by the York architect John Carr in 1754 and race days regularly attracted crowds of over 100,000. 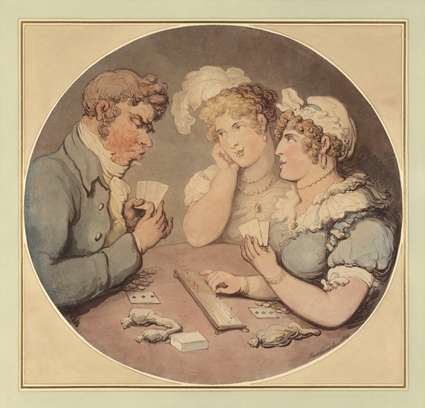 Gambling subjects were close to Rowlandson’s heart and he is known to have frittered away most of his wealth on gambling and especially the dice game Hazard. 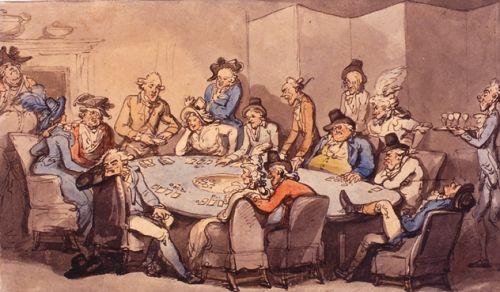 He would frequently gamble all night losing huge sums (see Matthew and James Payne, Regarding Thomas Rowlandson, 2010, pp. 170-171). 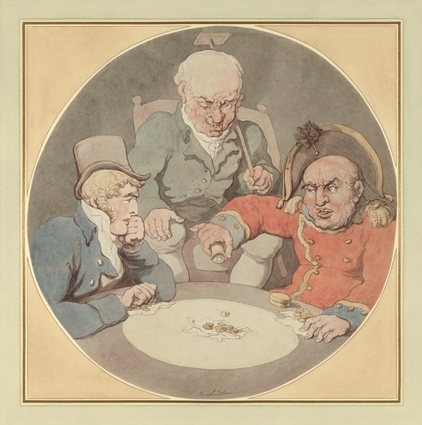 Rowlandson seems to have used circular compositions mainly for sporting and gambling subjects and they may have been intended for the decoration of screens (for examples, see John Hayes, Rowlandson Watercolours and Drawings, 1972, nos. 41 and 126 and Lowell Libson, op. cit., no.25). 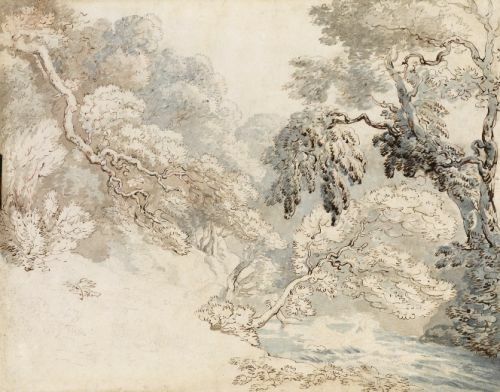 It has been suggested that the current drawings were painted for the Prince Regent to go on a screen at Brighton Pavillion which was being refurbished by the architect John Nash at the time. 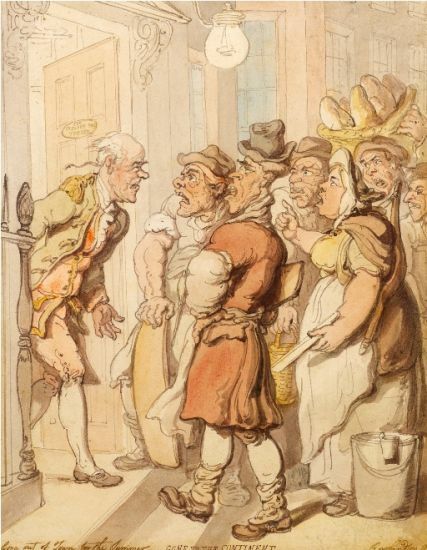 Rowlandson is said to have produced a set of screen decorations for the Prince Regent (see A.P. 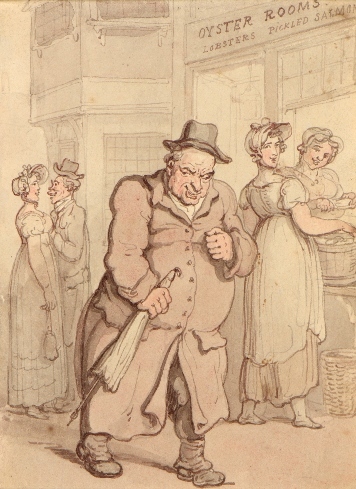 Oppé, Thomas Rowlandson: His Drawings and Water-Colours, 1923, p.21). 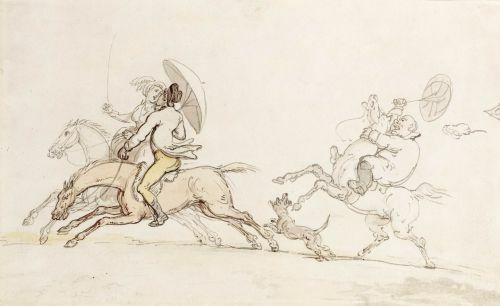 Byron is also said to have commissioned four similar drawings from Rowlandson depicting the sports of England (see Martin Hardie, Water-Colour Painting in Britain, vol. I, 1966, p.213). Circular 34.9 by 36.7 cm., 13 3/4 by 14 1/2 in. 93 x 152 mm., 3 ¾ x 6 in. 16 by 24 cm., 6 ¼ by 9 ½ in. Okehampton stands at the junction of the East and West Okement rivers in mid Devon just north of Dartmoor. 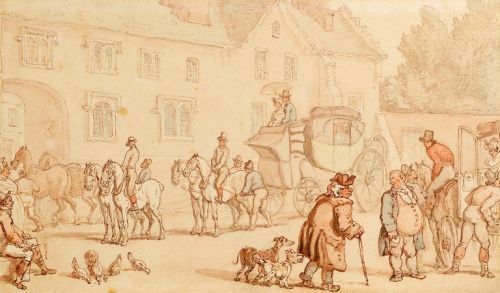 Rowlandson would have passed through Okehampton on his way to see his friend and patron the banker Matthew Michell who lived at Hengar House near Bodmin in Cornwall. 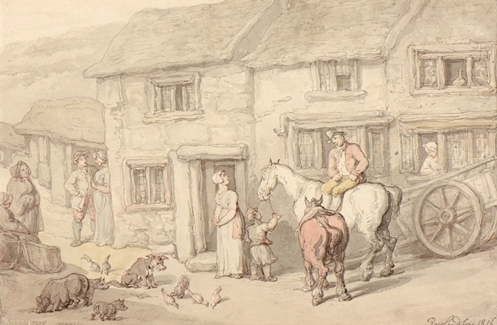 A view of Okehampton by Rowlandson dated 1791 was with Guy Peppiatt Fine Art in 2013 (see British Drawings and Watercolours, summer catalogue, 2013, no. 5). 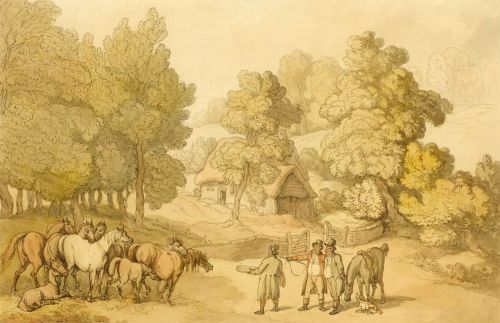 This is rare in Rowlandson's oeuvre in being a pure landscape with no figures. Iolo Williams mentions that `Rowlandson's contribution as a watercolour landscape artist.... must not be forgotten either, for it is often of great beauty' (Iolo Williams, Early English Watercolours, 1970, p.141) and he could have been talking about the present watercolour when he writes: `Here too are unexpected things, such as slight impressions, consisting of loose pale washes of colour over a few very free traces of pencil' (op. cit.). 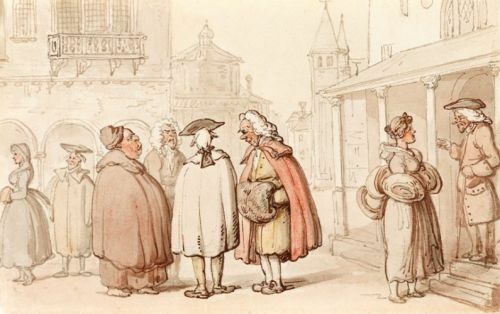 Rowlandson was a regular visitor to Cornwall to see his friend and patron the banker Matthew Michell from the 1790s until Michell?s death in 1819.Rowlandson frequently visited him at his estate at Hengar and also at his London address, Grove House near Enfield. 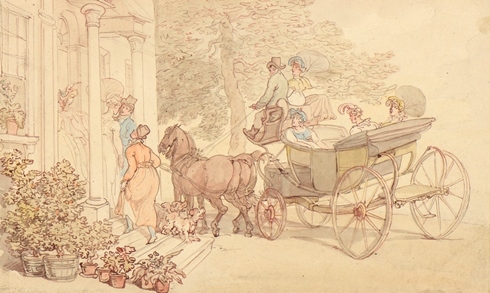 Michell owned over 550 watercolours by Rowlandson at the time of his death. Michell?s country house, Hengar House, was six miles north of Bodmin and Rowlandson enjoyed sketching in the surrounding countryside ? the River Camel passed through his grounds. 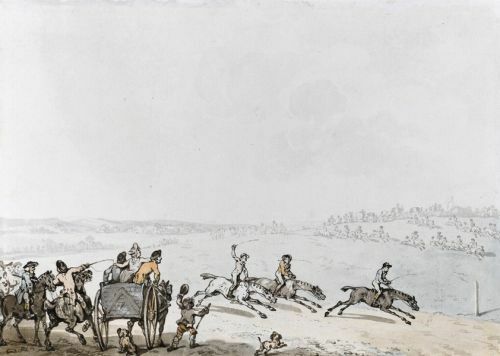 Racing on Epsom Downs was first recorded in 1661 and the Derby first run there in 1780. 13.7 by 21.3cm., 5 1/4 by 8 1/4 inches. This may be a view on the River Camel in Cornwall where Rowlandson often sketched when staying with his patron Matthew Michell in Cornwall. Apollo Magazine, April 1965, ill.
Blackwall is a district of Poplar near the Isle of Dogs and the mouth of the Lea river. 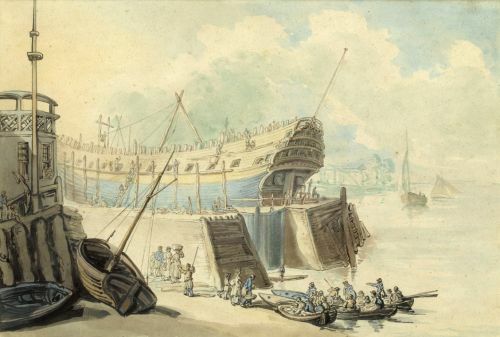 The Blackwall shipyard, opened in the late sixteenth century continued to repair and build ships, particularly for the East India Company, into the eighteenth century but did not finally close until 1980. A version of this watercolour inscribed `Perrys Dock Black Wall? was illustrated in The Connoisseur, December 1946. 137 x 208 mm., 5 ¼ x 8 in. 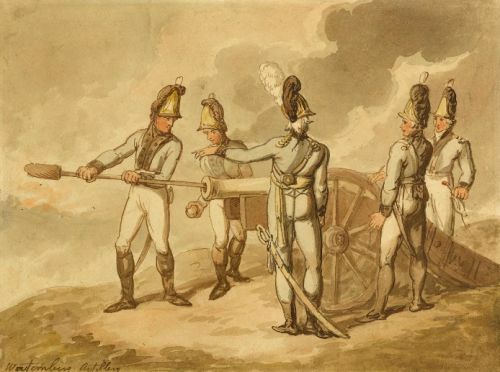 Rowlandson regularly visited Cornwall to see his friend and patron the banker Matthew Michell from the 1790s until Michell?s death in 1819. 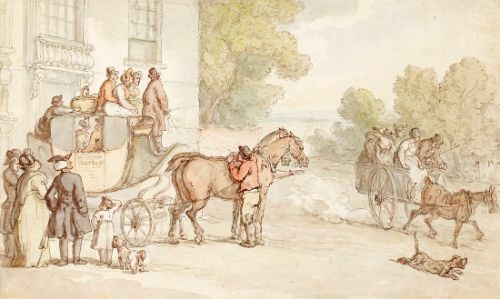 Michell owned over 550 watercolours by Rowlandson and his country house, Hengar House, was six miles north of Bodmin. Rowlandson enjoyed sketching in the surrounding countryside and also visited Michell at his home, Grove House near Enfield. 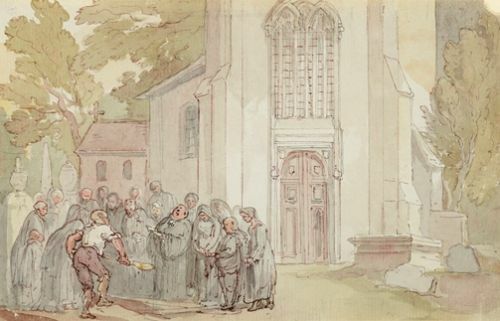 This important and unusually large, recently rediscovered drawing by Rowlandson dates to circa 1776-78 when he was in his early twenties. 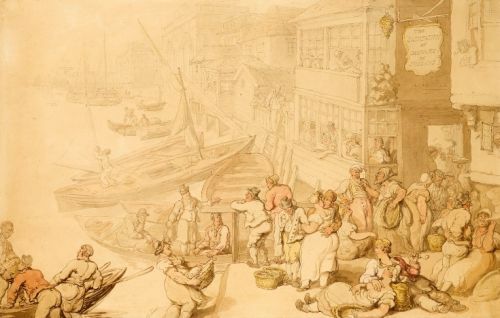 His early work shows the influence of John Hamilton Mortimer (1741-1779) in his use of pen and ink hatching but by the later 1770s Rowlandson is developing his own style and, as in the present work, increasingly uses watercolour as well as pen and ink. 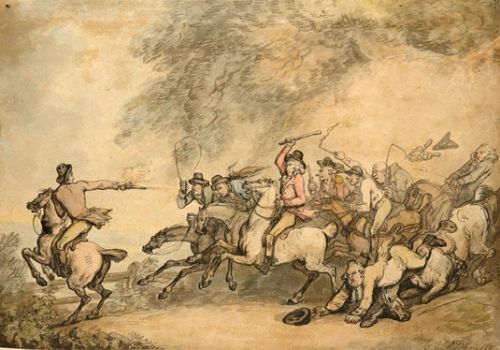 Highwaymen exerted a macabre fascination on the British public in the eighteenth century. They were viewed with a combination of excitement and dread and some became heroes. 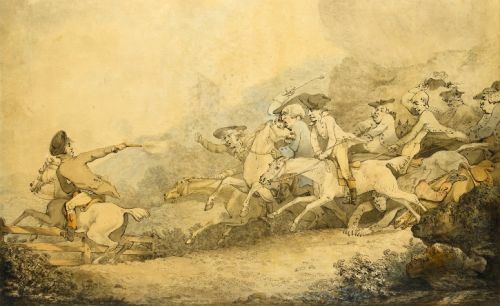 Rowlandson returned to the subject on a number of occasions with a version of the subject dating from circa 1790 shows the highwayman in the same poise, turning and firing at his pursuers as he jumps a gate. On the hill beyond is a shadowy gibbet, a reminder of the likely fate of a captured highwayman. 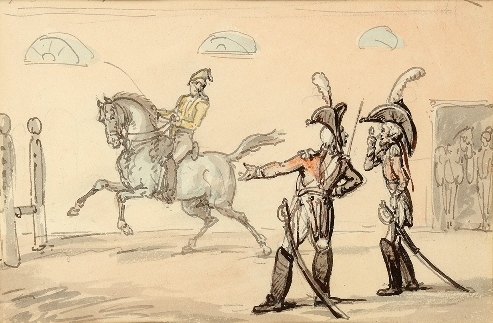 A drawing ?A Highwayman accosting a Nobleman in his Carriage? sold at Sotheby?s on 14th July 1994, lot 19 is dated to the late 1770s by the late John Hayes and relates closely to the present work. Another comparable drawing ?The Hanging of Dr Dodd? in the Houghton Library, Harvard University dates from the same period (see John Hayes, The Art of Thomas Rowlandson, exhibition catalogue, 1990, no.4). We are grateful to Hugh Belsey for his help in dating the present drawing. 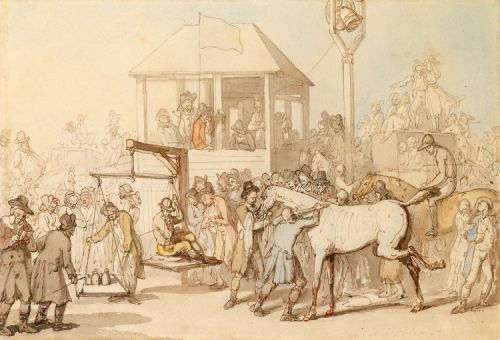 This drawing shows a jockey being weighed in before a race while his mount is being scraped prior to the race. 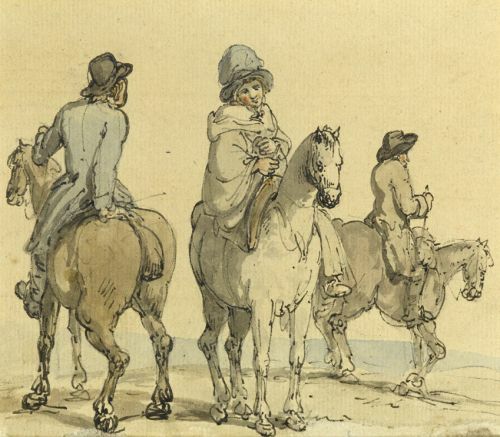 At race meetings in the eighteenth century, horse and jockey assembled at the rubbing-down house before a race where the sweat on the horse was scrapped off. 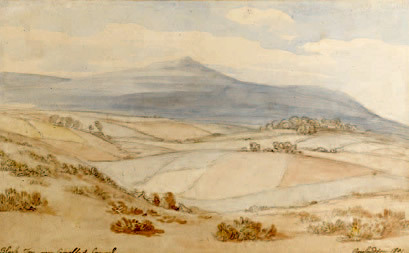 A finished version of this watercolour is recorded in the Halifax collection. The name on the doorplate reads `Sir Gregory Page-Turner?. Sir Gregory Page-Turner, 3rd Bt. (1748-1805) was a wealthy politician and landowner who was MP for Thirsk. 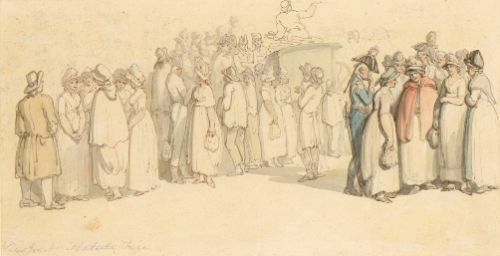 Stylistically this dates from the mid 1780s which suggests it may have been drawn on Rowlandson?s third visit to Paris in 1785. A hotel of this name was in the St Germain area of Paris at the time and Benjamin is known to have stayed there in the winter of 1776-77. 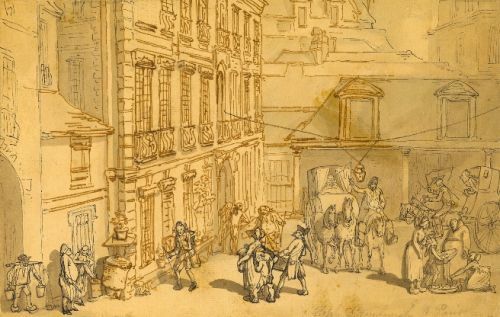 A similar drawing, once in the Witt collection, shows a scene outside the `Hotel de Montmorenci, Paris.? Okehampton stands at the junction of East and West Okement rivers in mid Devon just to the north of Dartmoor. 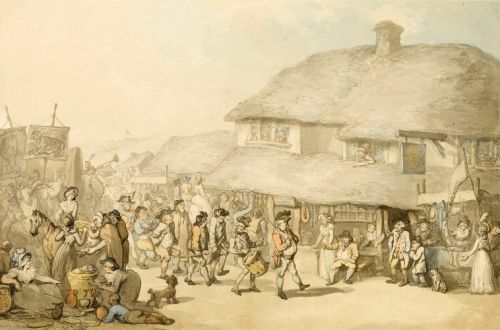 A smaller view of Okehampton by Rowlandson dated 1816 was sold at Christie’s on July 10 1984, lot 31. 31.0 by 47.5 cm., 12 ¼ by 18 ¾ in. This shows the Greenwich stairs next to the Salutation Inn with the Royal Hospital for Seamen (now the Royal Naval College) beyond. 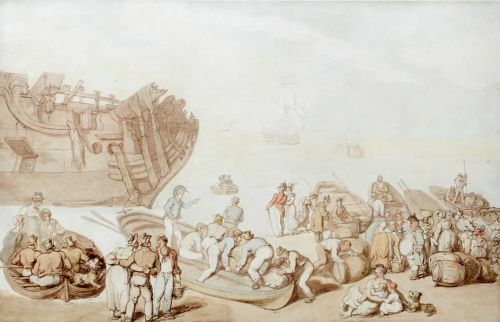 Rowlandson’s friend Henry Angelo later recalled that Rowlandson `was frequently making his sketches at Greenwich, his favourite resort, both for shipping and scenes relative to the assemblage of sailors…’ (see Angelo’s Pic Nic’; or, Table Talk, 1834, pp. 144-5). A slightly smaller version of this view is the Mellon Collection in the Yale Center for British Art (see John Riely, Rowlandson Drawings from the Paul Mellon Collection, exhibition catalogue, 1978, no. 72, ill. Pl. XXVIII) and another was sold from the Ingram collection at Sotheby’s on 8th December 2005, lot 171 for £15,000. 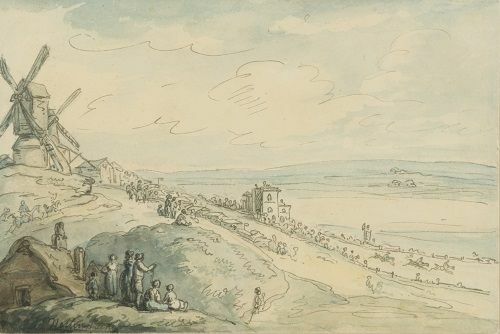 This drawing belonged to the composer Sir William Walton whose 1925 overture `Portsmouth Point’ was inspired by a Rowlandson print of the same name. 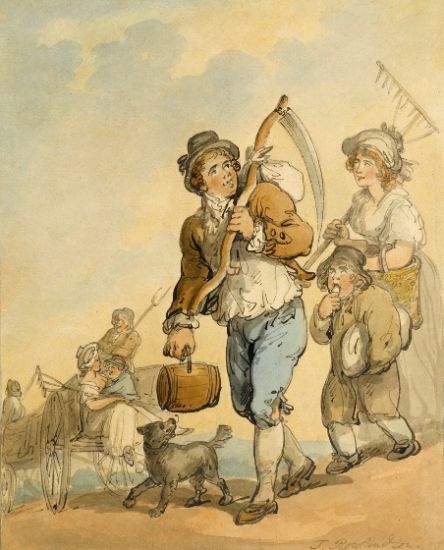 It depicts in musical form the life of British sailors in the eighteenth century. 15.1 by 22.2 cm., 5 ¾ by 8 ¾ in. 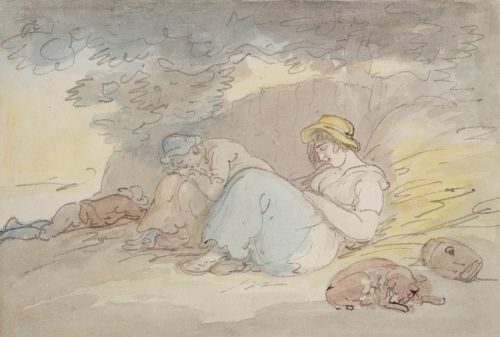 A similar drawing `Labourers at Rest’ is in the Yale Center for British Art (see John Baskett and Dudley Snelgrove, The Drawings of Thomas Rowlandson in the Paul Mellon Collection, 1977, no. 82, ill.) and another, `Haymakers at Rest’ is in the Royal Library at Windsor (see A.P. Oppé, English Drawings at Windsor Castle, 1950, no. 525, pl. 84). Bears signature lower right: T. Rowlandson. 24 by 18.8 cm., 9 ½ by 7 ¼ in. 14.4 by 23.8 cm., 5 ¾ by 9 ½ in. 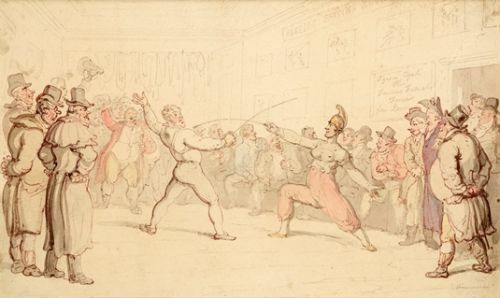 Rowlandson was evidently intrigued by the idea of a man and woman fencing as he drew at least five such studies. 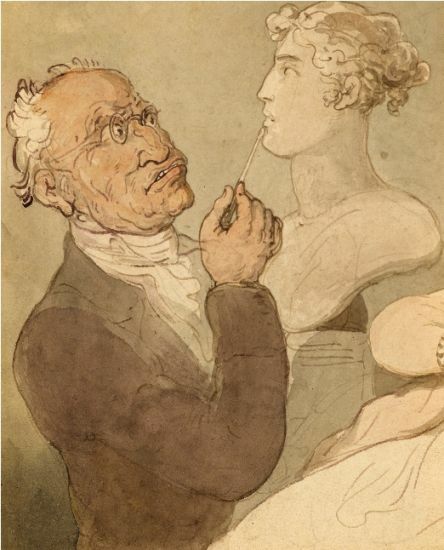 One in the Dent collection depicted Henry Angelo and `Madame Cain'. `Madame Culloni and Mons. 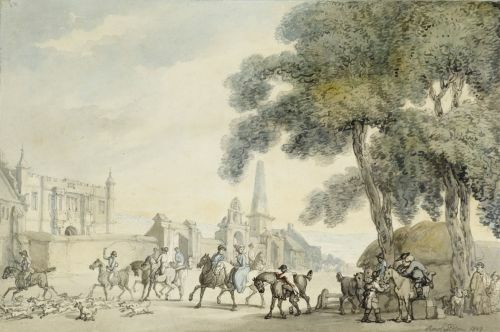 Renault' in Paris is recorded in the Dent Collection with another version in the Yale Center for British Art. Another, of `Madame Kelu famous Fencer Native of Italy 1816' was sold at Sotheby's on 22nd March 1979, lot 57. 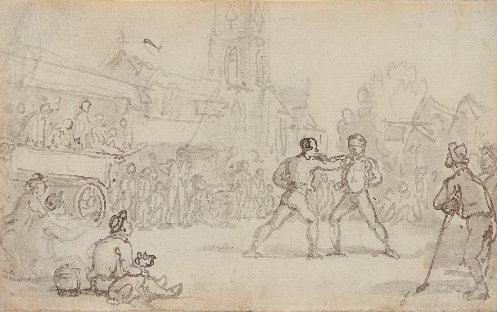 Henry Charles William Angelo (1756-1835) was a close friend of Rowlandson for over fifty years and the artist depicted his Fencing Academy on a number of occasions. Angelo inherited the Academy from his father, the famous Italian swordsman Domenico Angelo in 1785. They were located over the entrance to the pit door of the Opera House, Haymarket but were destroyed by fire on 17th June 1789 when Angelo moved the Academy to no.13 Bond St. It became more akin to a gentleman's club and Charles James Fox, Sheridan and Byron were regular attendees. 32.4 by 46.5 cm., 13 by 18 1/2 in. 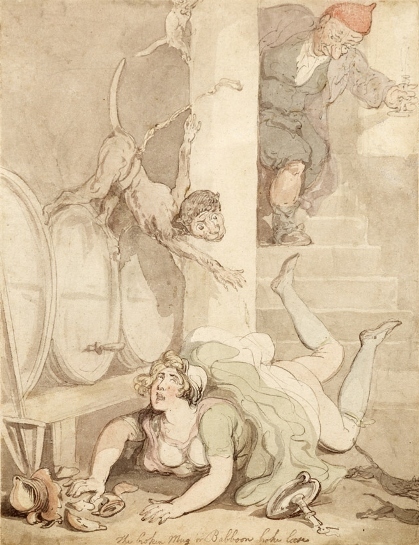 Sixty-three drawings and watercolours by Rowlandson from the collection of Sidney Phipson were exhibited at the Anderson Galleries, New York in 1923. 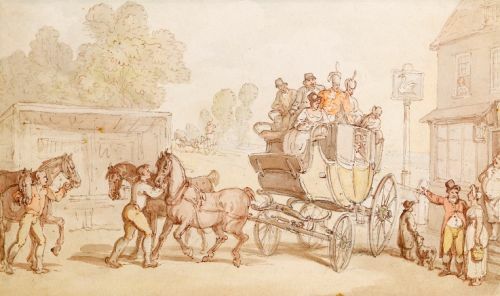 This watercolour was published as a pair to `The Attack’ which depicted a lady and gentleman in a coach being accosted by a highwayman (for a full description, see Joseph Grego, Rowlandson the Caricaturist, p.289). 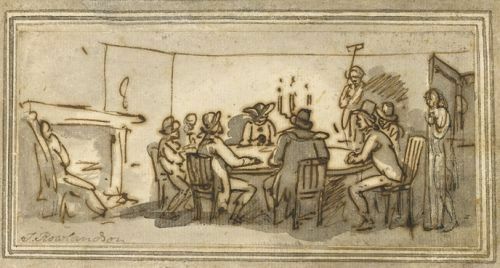 A copy of this engraving is in the Royal Collection (RCIN 810410). 16.5 by 22.3 cm., 6 ½ by 8 ¾ in. 140 x 222 mm., 5 ¾ x 8 ¾ in. 17.3 by 22.5 cm., 6 ¾ by 8 ¾ in. 19.6 by 24.6 cm., 7 ¾ by 9 ½ in. 15.2 by 19.4 cm., 6 by 7 ½ in. 14.8 by 24.2 cm., 5 ¾ by 9 ½ in. 14.8 by 23.4 cm., 5 ¾ by 9 ¼ in. 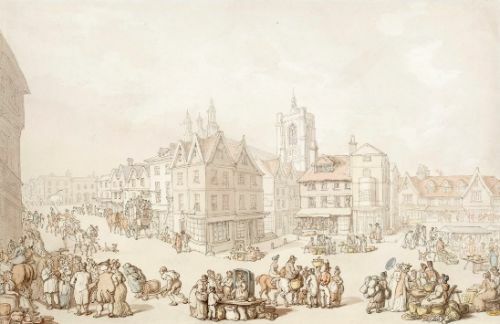 The Market Cross which dates from circa 1490, stands in the centre of Malmesbury at the corner of Market Cross and Gloucester Street adjacent to the Abbey. 13.3 by 9.6 cm., 5 ¼ by 3 ¾ in. 12.9 by 25.3 cm., 5 by 10 in. 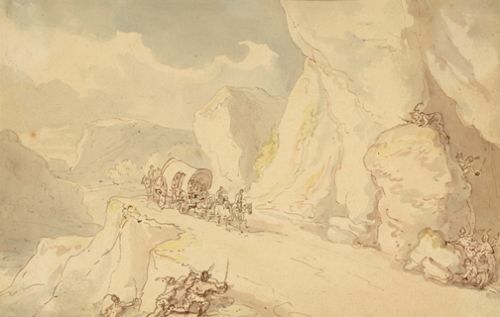 This dates from Rowlandson's tour of the Isle of Wight with the businessman and amateur artist Henry Wigstead and Samuel Howitt in 1791. 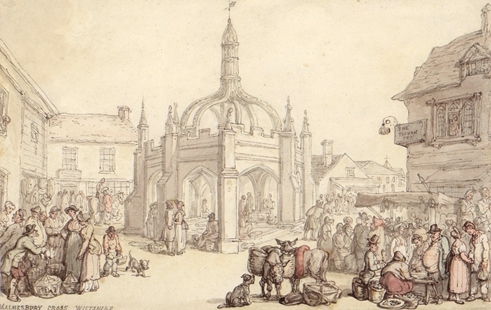 They travelled via Winchester to Lymington where they took the ferry to Yarmouth. They spent several months on the island exploring it thoroughly. 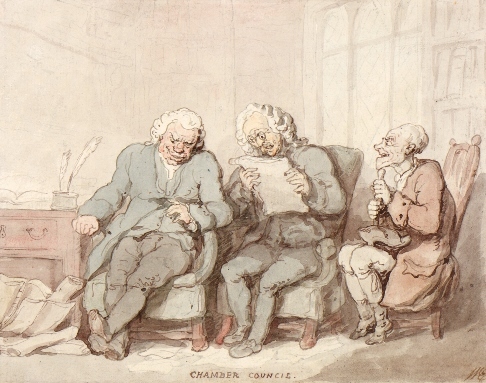 For more on the tour, see Matthew and James Payne, Regarding Thomas Rowlandson – His Life, Art and Acquaintance, 2010, pp. 135-139.